as a phone call away! Low Series Low Profile Hex Cassette Wrench is essential tools for limited clearance and long bolt applications. Torque range of 250 ft-lbs. to 30,000 ft-lbs. A total high torque hire solution! All our Low Profile Hex Cassette Wrenches hire with 240V or Air Hydraulic Pump, hose, & Calibrated Torque Chart in a weatherproof Case. 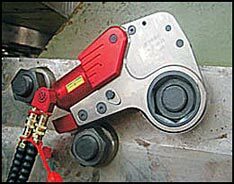 Low Profile Hex Cassette Wrenches offer the flexability to go where other Torque Wrenches cannot. 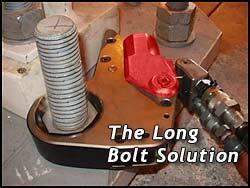 Long Bolts: run-down thread by hand, place Cassette over the bolt like a Ring Spanner, let the Hydraulics do the hard work, press the Reaction Pawl to release pressure and remove the Tool - easy! Tight Space around the nut: where limited space next to a housing wont fit a Square Drive Tool + socket, the minimum wall of the Hex Cassette Wrench gets in where nothing else will! Hex Cassette Hydraulic Multipier low profile models offer many solutions for flanges, pressure pipes & heat exchangers for the refinery industry. These tools offer limited clearance features to solve access issues. 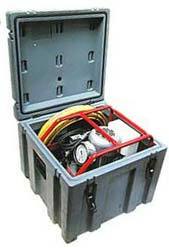 Square Drive Torque tools offer versatility. 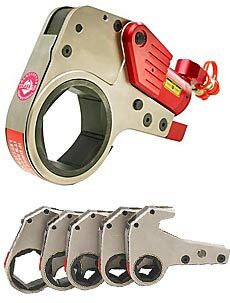 Limited clearance tools: like a ring spanner connected to a Torque Multiplier, with a nose radius similar to impact sockets. 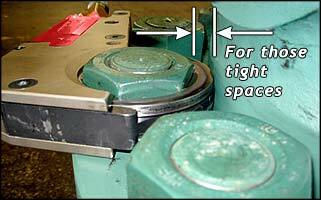 Tight access tools permit torque to be applied to bolting thought previously impossible. Long extension reaction arms are available too. Video of a Pipe Flange being tightened with a WREN low profile Cassette Tool. Although a Square Drive Tool would do this job equally aswell, the Low Profile Hex Cassette Tool can be used as a standard tool too. Hex Reducers can be used to step down a/f sizes in cassette links, thus expanding the range of a single Hex Casette Link. These Reducers come with a locking nut (retainer) to ensure they dont drop out of the Cassette. The low profile hex cassette wrench offers a nose radius similar to impact sockets. The small radius ensures the tool can access tight applications like pipe flanges. 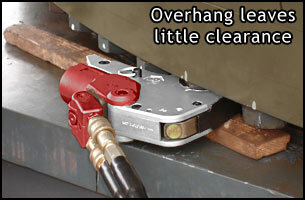 The reducers can be secured with a retainer if required (see pic). NOTE: When selecting reducers ensure your radius clearance will still permit hex access. By using an Insert you INCREASE the nose radius, thus needing MORE space to fit the tool.